So, it’s a right-leaning storm as those with RWNJ ideologies get their party’s votes: Barletta, Wagner, Smucker, et al. These are the faces you’ll be seeing. Gas prices are poised to pass the $3.00 mark! Hang on, stormy weather ahead. 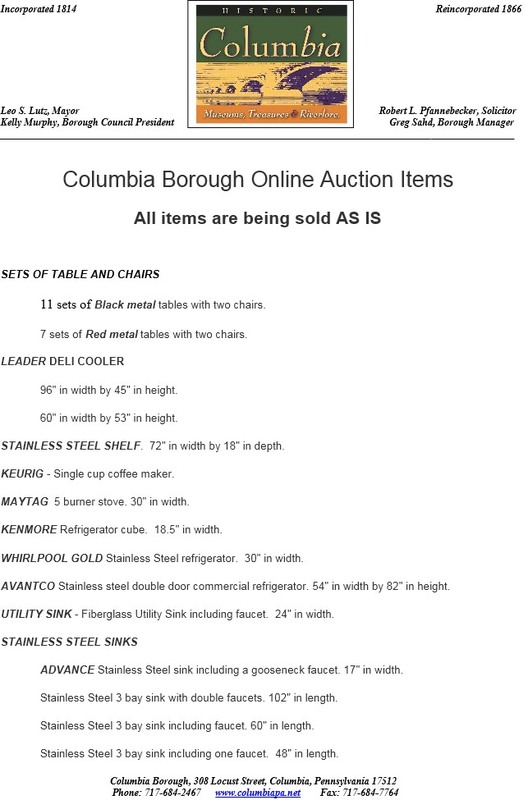 Be sure to check out the Borough’s ON LINE AUCTION: Notice is hereby given that the Borough of Columbia, 308 Locust St, Columbia, PA, Lancaster County, Pennsylvania, will be holding an on-line auction of surplus items. At Monday’s borough council meeting, the assistant borough manager stated she’s entertaining several parties who are interested in the Columbia Historic Market House for undisclosed purposing. Taxpayers already paid for the market house items, now they must pay again! I’m disappointed that one has to create an account and navigate yet another site in order to bid on market house items. I wanted something from the auction, but not enough to bother. This also excludes those residents that do not have computer access. It would have been nice to have those interested in the items put their names into a drawing and announce the winners. Residents could have browsed items at the market and entered their names for whatever items they had an interest in obtaining. Bet we’ve not heard the last about the Keeley stoves! I did not want that style of Keeley stove, but I would have liked a bistro set to replace the one stolen off of my porch a few years ago. I have to wonder how much the borough will see out of the smaller items. These items should have been given away in a random drawing. Give something back to the taxpayers. Breaking news; the Keeley’s have been sent ahead across the Styx by some politicians hoping for preferential treatment. Mr. D – you make a brilliant reference here. Though we don’t know for certain, it’s entirely probable (and fitting) that the elected public servants populate the underworld on the other side of the river Styx.